The Nasdaq Dividend Achievers Index is a group of over 150 companies that have consistently rewarded shareholders with increasing dividend payouts. Companies qualify for the Dividend Achievers List if they have raised their dividends each year for at least 10 consecutive years and meet certain trading liquidity requirements. Why is the Dividend Achievers List popular? Generally speaking, companies that consistently raise their dividends are financially healthy, growing businesses. Over time, these types of companies have done well in the market while providing shareholders with safe, growing income. You can download the list of Dividend Achievers with their up-to-date dividend yields by clicking here. Invesco offers an exchange traded fund (ETF) that tracks the Nasdaq Dividend Achievers Index. The fund is called the PowerShares Dividend Achievers ETF and trades under the ticker symbol PFM. We analyzed this ETF to evaluate the performance of the Dividend Achievers Index. As seen below, the Dividend Achievers group has collectively outperformed the Russell 3000 Value Index over the last 10 years and since its inception. Dividend Achievers have also recorded less volatility than the broader market, helping preserve investors’ capital and deliver even better risk-adjusted returns. High quality businesses often generate more predictable earnings, which makes their stocks fluctuate less. For example, during 2008 the Dividend Achievers Index fell by 29%, which isn’t pretty but was meaningfully better than the S&P 500’s drop of 37%. Looking at the sector mix of Dividend Achievers can help us identify areas of the market that are potentially more reliable for safe, growing income. 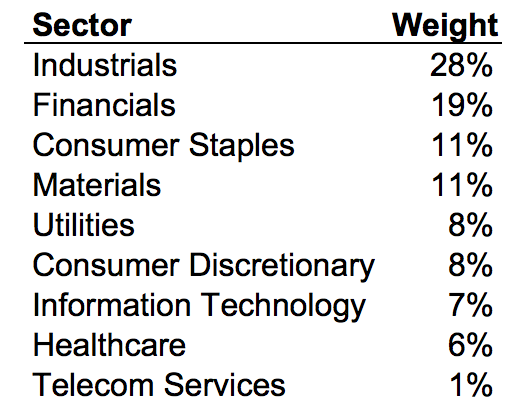 The far majority of Dividend Achievers come from the consumer, industrials, financials, and utilities sectors. Many areas within these sectors are characterized by a slow pace of change and more predictable demand trends, which helps create an environment favorable for consistent dividend growth. Technology was among the least represented sectors compared to the broader market because of its faster pace of change and higher focus on reinvesting for growth rather than returning capital to shareholders. Investors like to look at the Dividend Achievers List because it contains a number of businesses that have demonstrated a more meaningful commitment to their dividends compared to the average firm. However, a 10-year dividend growth streak is certainly no guarantee that a company’s dividend payment is safe, much less sustainably growing. There were plenty of dividend cuts during the last recession to prove this point. Investors managing a dividend portfolio can certainly use the Dividend Achievers Index as a resource for new idea generation. However, they should remain aware that the list contains a number of companies that have benefited from more luck than skill. Remaining focused on business quality and being aware of key risk factors that impact dividend safety and growth are prudent things to do before making any investment decision.